The Something Big! DJs will be joining local band Macca at the back room of the White Hart, High Street, Newmarket on New Years Eve. When Rinaldi isn't singing the Something Big crew are playing records. After successful support slots at The Man on the Moon in Cambridge and Dublin Castle in Camden, The Garage in Highbury. Something Big will contine to provide DJ support spinning 60s Soul & Beats at selected gigs. THIS IS OUR MUSIC! A truly fine evening in Camden last week. 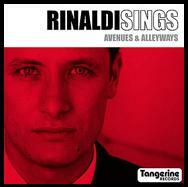 Fantastic performance by Rinaldi, who attempted and pulled off things that, by rights, one could only acheive if one was Sammy Davis Jnr! ‘You're Alive’ sounded particularly beautiful . . .
Bob Kelly was his usual exciting self, Lois 'Lane' Wilson, Gary Meaden-Malby and 'Soul Thing' Rodders all spun great discs (the band leaving the stage to 'Wind Chimes' and 'Surf's Up' must qualify as a rare moment in Rock venue history!). And no event has the ultimate seal of approval without the presence of the Magnificent Bultitude. A scene bereft of the great man is a scene bereft. Rinaldi is our leader . . .
Once again I implore you, THIS IS OUR MUSIC!